The stakes of grasping how the far Right operates have not been higher for a long time. Hard Right racism is certainly nothing new, but a decade of third way neoliberal consensus gradually collapsing has left a vacuum that outright fascists are scrambling to fill. The analyses of critical geographers have much to offer in this urgent situation, where forging antifascist politics to defend democracy and the populations that fascists target has become a political priority. Geographers might help to critically dismantle the spatial foundations and implications of resurgent fascist politics. Critical geography can also make important contributions to an emerging history of the antifascist present by highlighting the translocal connections of the European antifascism much ongoing scholarship studies, unpacking the spatilities of movements often framed as a continuation of national resistance to 1930s and 1940s Nazism. This might involve looking at the decisive role played by diasporic communities and anticolonial radicals in the reinventions of European antifascism from the 1960s onwards, but also the more contemporary modes of translation and travel of ideas and practices to new situations evident in recent American mobilizations inspired by waning European tactics (Featherstone 2012; Mohandesi 2017; Provenzano 2017). Lastly, as I will argue in this essay, the geographic community can also contribute in a more concrete sense by mapping the spatial repertoires of fascist movements. Analysing the spatial practices and imaginaries of fascist street politics might prove a particularly useful way to help uncover vulnerabilities that antifascist movements in all their diversity might take advantage of. The police is trying to clear a route for a neo-nazi march through one of several large antifascist blockades in Gothenburg in 2017. Fearing that these blockades meant that they would not be allowed to march as promised, neo-nazis tried to break through police lines which forced the police to apprehend nazi marchers and cancel their march. Photograph by Victor Pressfeldt, used with permission. Fascism is a notoriously complex political phenomena manifesting itself in many different ways. One aspect of fascism that periodically comes to the fore is fascists’ fascination with violent street politics as a way to stage an aggressive brand of masculinity (Brink Pinto 2018; Virchow 2007). In the English-speaking world, the 1936 Battle of Cable Street in London’s East End is the most well-known example of how fascist movements imagine and practice street politics in this way, and how antifascists successfully exploited this need to display dominance and control over the streets when devising their counter-tactics Cable Street is, as historical research makes clear, only one among many interwar variations on this theme. Most explicit is perhaps German Nazi strategist Joseph Goebbels, who boasted about his detailed plans for conquering “Red Berlin” by staging provocative meetings in parts of the city completely dominated by the Left so that armed thugs could attack anyone reacting, thus demoralizing resistance. This kind of struggle not only broke out around public meetings. The Nazi’s SA paramilitaries carefully orchestrated violence as they marched through the red, working class areas’ of Germany’s large cities, making sure that armed plainclothes SA-members in the crowd helped the uniformed marchers fight protests. This veritable war for control over the streets was also fought in more mundane ways such as organised attacks against socialist-aligned pubs used for meetings and cultural events in working class districts. Similar dynamics were also evident in Italy, with highly organized squads of fascists trucked to flashpoints to break the Left’s hold on urban centres (McElligott 1983; Reichardt 2007). A struggle for the street is not the only spatial aspect to fascism. One of many more modes of far Right violence with its own spatial dynamic is so-called lone-wolf or small-cell terrorism. Fascists often use these tactics to spread fear and create tensions specifically in multicultural urban areas as a way to provoke violent responses and escalate an imagined low intensity “race war”. Inspired by the US-based armed white supremacist group The Order in the 1980s (Belew 2018), we have seen in more recent years lengthy trails connecting seemingly “random” shootings of people of colour, for instance by the NSU in Germany and fascist Peter Mangs in Sweden (Gardell 2015) . Still, the fascist street politics steeped in an aggressive masculinity that has been around since the interwar years remains a core element of the far Right’s movement culture. This is evident in Tommy Robinson-led marches through London, the Unite the Right rally in Charlottesville, the well-ordered marches of the Nordic Resistance Movement in Scandinavia, and countless other examples. Unfortunately public debates on how to respond to these situations are often locked in debates about whether the actual, and potential future, violence of the far Right merits protesters using violent means to stop fascist marches (Bray 2017). 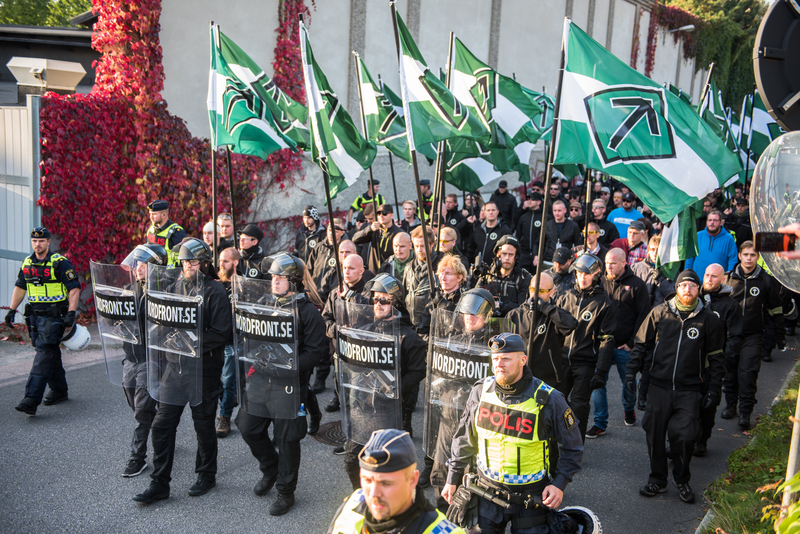 The openly neo-nazi Nordic Resistance Movement marched in 2017 in tight formation surrounded by shields and guards through Gothenburg, the city which both traditionally and now is the most left-leaning large urban area in Sweden. Photograph by Victor Pressfeldt, used with permission. In an ongoing research project on the history of Scandinavian antifascist movements since the 1980s that I have been involved in, we have found it useful to side-step questions of the legitimacy of violence and instead map how both fascist and antifascist street politics are constituted by complex and relational sets of what sociologist Charles Tilly (2003) called “spatial claims”. One key finding is that the far Right’s spatial claims tend to shift between two dynamics. On the one hand, the fascist far Right is deeply concerned with what one might think of as a territorial control over space, often connected to a specific set of practices defining fascist masculinity in terms of a virile and battled-hardened homo-sociality (Brink Pinto 2018). Territorial spatial claims might take the form of repetitive acts of violence making places like pubs, youth clubs, subway stations or school yards virtually off limits for large populations. This geography of everyday violence is often not articulated as a political project, but has in certain places been formulated as an explicit strategy, with the “nationalist zones” proclaimed in parts of East Germany being the most well-known example (Döring 2011). Naming this kind of low intensity, mundane terror as a spatial claim that enacts visions of cleansed space as a kind political tactic not only shows that it is more than random acts of violence. Analysing the rhythms and recurrences of these spatial claims as a way to produce fascist territories illuminates the function these actions have for far Right movement-building. In turn, this points to the need to devise political strategies to both stop this violence in the short run and disrupt the function it has for bolstering fascist movements in the longer term. The most pronounced way that claims to territorial control over specific areas plays out in confrontations between actual movements in our research was, however, through confrontations in and around marches (Brink Pinto and Pries 2013). The fascist marchers we studied since the 1980s were, much like the original fascists and Nazis in the 1920s, fixated with violating what were perceived as “red zones”. Making claims on such spaces that undermined an opponent’s real or imagined dominance thus required being in those spaces and acting out particular performances. One fascist tactic was upholding a disciplined demonstration that could make its way through “hostile” spaces, and if that failed direct confrontations with physical violence appears as an almost attractive option for fascist activists as long as the results signalled aggressive dominance. Just as with the everyday violence staking fascist territories, these attempts to use actual and threatened violence in and around marches to undermine leftist areas was by no means random but part of a movement’s repertoire and political culture. Consequently, antifascist responses were most effective when protestors took the far Right’s claims seriously and designed strategies seeking to undermine them by denying them to ability to perform these claims according to script, rather than mechanically trumping any fascist act of violence with an even more violent responses. The territorial spatial claims we studied in fascist marches were tied to a second kind spatial claim which instead used space as a public sphere for voicing opinions. This was a spatial politics much more in tune with liberal ideals of public space as a legitimate site for expressing political grievances. It was often more mainstream groups that responded to fascists’ public claims on space and the preferred response was seeking to mobilize larger rallies where counterarguments against racism could be raised, unlike more militant antifascists that tended to grapple with ways to undermine the fascists’ territorial claims. Looking at a longer series of related yearly events made clear that the fascist Right was defeated not only by contesting the ways it used the streets. When large mainstream protests with speeches by well-known political leaders challenged the legitimacy of much smaller fascist demonstrations, the fascists shifted to more openly aggressive territorial claims. And when such territorial claims on space were circumscribed by the pressure created by militant antifascist counterclaims, the far Right instead took refuge in more orderly marches emphasizing their right to free speech. This often created a kind of asymmetrical situation that worked to the fascists’ advantage, far Right territorial claims being largely immune to large but unconfrontational protests, and far Right public claims easily gaining police protection securing them when countered by militant activist’s territorial counterclaims (Brink Pinto and Pries 2013). 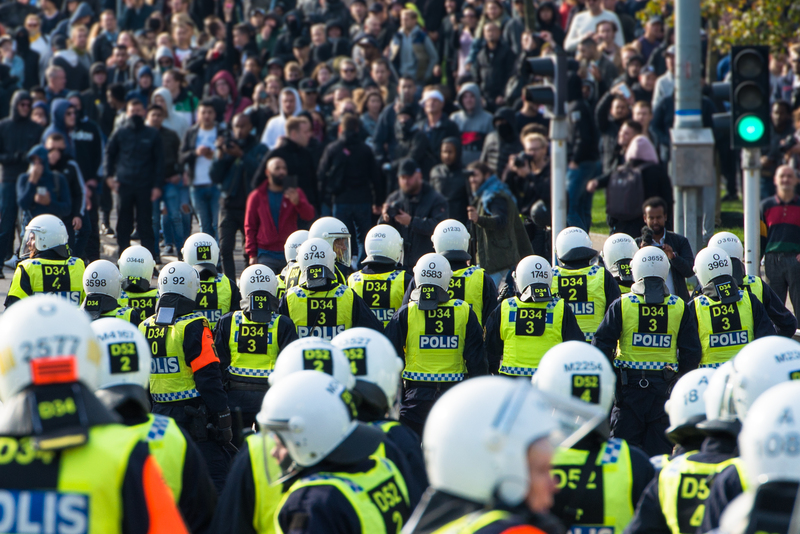 Antifascists rehearses a specific way of appropriating space at the head of large demonstration in Malmö 2014. The same formation and systematic use of club-like red flags was used a few months later in the same city when antifascists tried to break through police lines to occupy the gathering point of neo-nazis. Photograph by Victor Pressfeldt, used with permission. In the cases we studied, it was when both the fascists’ territorial and public spatial claims were disrupted at the same time that their activists were forced to retreat from street politics altogether and their movement’s momentum collapsed without access to this crucial resource (Brink Pinto and Pries 2019). Thus, experiments with spatial politics that in complex ways combined challenges to fascism’s territorial and public claims on space, rather than a certain level of liberal respectability or militant violence, appears to be key to defeating the far Right when it is involved in this kind of street politics. Sometimes these counterclaims included elements of direct and brutal interpersonal violence, but sometimes antifascists strategically abstained from violent tactics to instead strategically pressure the police into curtailing the far Right’s claims on space with other means. Street politics is only one spatial aspect of the far Right’s repertoire. Indeed, this kinds of spatial claim has become increasingly wrapped up in online representations that change both the far Right’s activism and the possibilities of resisting it. Racist rumours spreading across social media have proved a powerful tool to mobilize the far Right beyond its immediate milieu, and antifascists have also adopted new ways to combine streets politics with an online presence. The ways that social media and street politics might be combined by antifascists is an issue that my colleague Samuel Merrill and I tried to grasp in a paper recently published in Antipode (Merrill and Pries 2019). 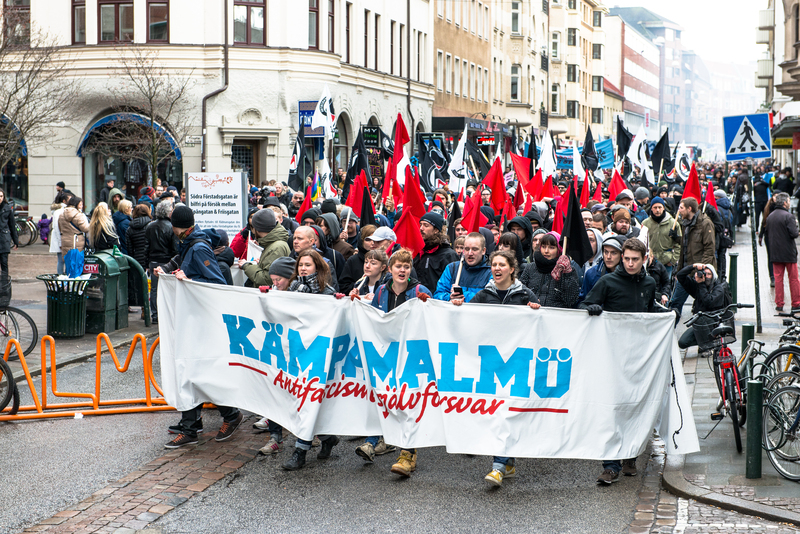 In our article, “Translocalising and Relocalising Antifascist Struggles: From #KämpaShowan to #KämpaMalmö”, we studied the way that in 2014 a physical street confrontation between fascists and antifascists in the Swedish city Malmö, which left several leftists hospitalized, escaped the confines of local street politics by being taken up across social media around the hashtag #KämpaShowan. In the end, the online echoes of this very local event was again drawn into a local context by activists calling for what became one of the largest demonstrations in the city’s history. This proved an opportunity for antifascists to reframe the confrontation in terms more politically aligned with their agenda than the depoliticized narrative that had dominated the online response. In the large demonstration a rather small group of a few hundred organized antifascists leveraged their control over how street politics were performed to again point to, among other things, the concrete task of contesting fascists’ spatial claims. So while the fascist Right mobilizes in complex online-offline and multi-scalar ways based on opportunistic alliances with right-wing populists around exclusionary articulations of nationhood, race and gender, the spatial claims of street politics appears to remain an important aspect in fascist political culture. Geographers can do important work to further analyse the dynamics of these claims, and how their vulnerabilities are explored and exploited by actual protests and circulated in various kinds of ways. This is not only a project that shifts debate away from gridlocked abstraction on the philosophical justifications for using violence against violent, totalitarian movements to a more strategically productive terrain for those understanding antifascism as a project firmly rooted in traditions of radical democracy. Taking the geography of fascist and antifascist movements seriously can help define new ways of strategically contesting fascism as the kind violent street politics that often appears to be its strongest point. Johan Pries is a postdoc in the Department of Urban and Rural Development at the Swedish University of Agricultural Sciences in Uppsala. As well as researching and teaching about social movements and political conflict, he works on the knowledge politics of spatial planing and urban development as a field of technocratic expertise. You can read more about him here. 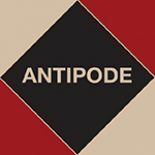 This entry was posted on 30 January 2019 by Antipode Editorial Office in Interventions and tagged activism, antifascism, digital geographies, European politics, far Right, fascism, Malmö, masculinity, online activism, protest, public sphere, relocalisation, right-wing populism, social movement theory, spatial claims, spatial repertoires, street politics, Sweden, territory, translocalisation, urban politics, violence.